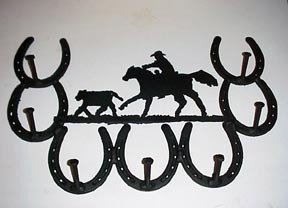 Western accessories for your home. Everything from candlestick holders to tables. 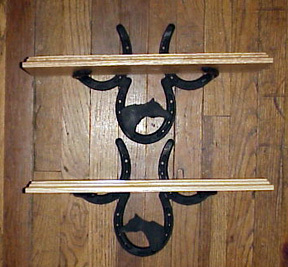 Each item is hand-made using horseshoes, bits, spurs and anything else that happens to be laying around the farm! Email us to order any item on these pages. We also make custom orders! Just let us know what you have in mind. 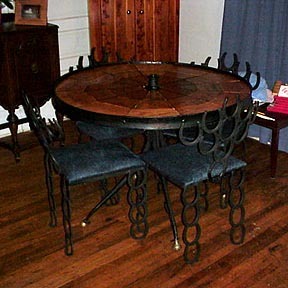 This table is made of an old iron wheel with horse hames for legs. The top is oak flooring from an old schoolhouse. 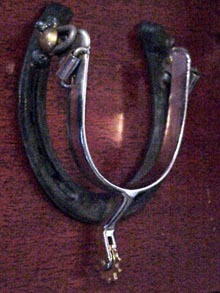 These doorknockers are made from horseshoes and spurs. This hanger can hold caps, coats, tack or whatever you choose. We have many different designs and types of hangers. We can also try to make a custom design for you. Just tell us what you want and we will see what we can do!More Hangers, etc. 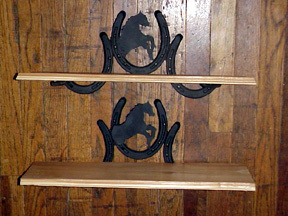 This pair of shelves is made from solid oak and 3 horseshoes. The metal cutout of a horse head is hand drawn and cut. Email us at ssrArabs@msn.com to place an order or find out about prices. Check out the Carson Community Rodeo site! Want to join the ring? Click here forinfo.